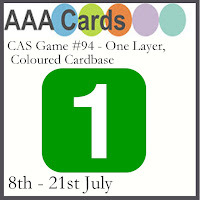 I wanted to play along with the joint challenge at Less is More and AAA Cards-coloured card base and one layer. I love one layer cards and love using coloured card base so had to join in. 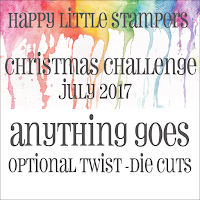 Then I saw CAS-ual Fridays were having a Christmas in July Challenge. Well inspiration finally spiked and I had a go at CASEing one of my own cards but made it harder for myself by wanting to use embossing and this is not so easy on one layer! Also doing this meant changing the lay out of my card-this took a lot of messing around but eventually I got the placement of the sentiment where I liked it...see I know CAS cards look easy but often take a while just planning where you want to place elements so they are pleasing to your eye! These stamps are all from CAS-ual Fridays and I heat embossed them in a sparkle snow powder on blue card base. I actually love how it turned out, all sparkly and CAS....you know that makes me happy. Plus with the postage costing so much at the moment I am trying to make all my Christmas cards for abroad one layer! Beautiful! Love the contrast of the white and blue. And you're so right about placement being key to a successful CAS card. Thanks for playing at AAA Cards. Simply beautiful, Sandie. Great design. The white embossing pops beautifully on the dark blue card base. Another CAS perfection. Thank you for joining us at Less is More in collaboration with AAA Cards. Perfectly CAS! Thanks for sharing at Less is More! Love this sophisticated CAS design!!! 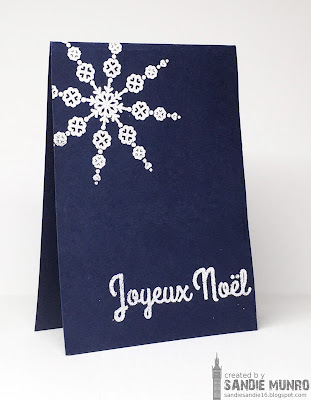 I am drawn to the striking white embossing on navy cardstock! Thanks for joining HLS Christmas Challenge! What a classy design, Sandie. SO perfectly you! Wow! This card is stunning! So simple and elegant! Perfect for the challenge theme! Thanks for joining us at AAA Cards! This looks amazing Sandie. The sparkly white must be amazing IRL on that dark base. Very inspired and super CAS layout too! Gorgeous...love that beautiful deep blue! CAS cards, and one layer ones especially, aren't quick for me to make. Sometimes I need to redo it 2, 3 even 4 times. Smudges, something uneven, something not in its right place etc. But once you got it right it's quick to reproduce. This is ultra simple and pleasing to the eyes. Beautiful navy and white. Thank you for sharing with us at AAA Cards. Ooh, this is so chic and elegant Sandie. I love your beautiful CAS design.